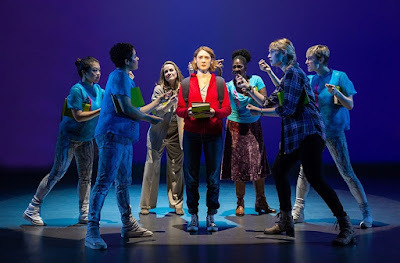 Carol's Theatre Reviews ~ It's Fun To Go Out: Globe’s New Musical “Life After” Off To A Grand Start. Globe’s New Musical “Life After” Off To A Grand Start. Britta Johnson’s entrance on to the U.S. stage with her bittersweet and poetic musical “Life After”, through April 28th now in a regional premiere production at the Old Globe Theatre has pathos, levity and promise of life after-Globe. “Life After” has heavy- duty, as well as LOL moments. It also leaves the audience with questions open for discussion on exiting the theatre; at least it did for me. That’s not a bad thing. Life and death, grief and healing are matters of both heart and soul, and if one is uncomfortable with it, well that’s OK too. Those in my age group will have dealt with these matters more than one would care to recall, but when a vulnerable teenager is forced to deal with the loss of a parent, that’s a cloth of a different color. We acknowledge that not everyone acts, or reacts to the loss of a loved one in a conventional way. But “Life After” is not conventional nor is it maudlin; it’s a celebration of life. 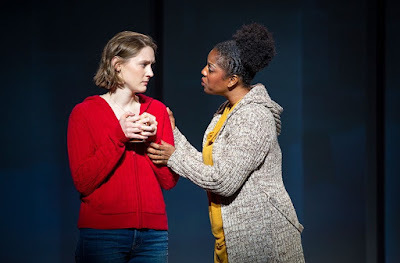 Director Barry Edelstein has staged Johnson’s piece with eloquence providing all the characters space to learn and grow, pick up pieces and move on as temperament deems. Alice (Sophie Hearn) is sixteen and has a busy social and school schedule. Her Dad Frank (Bradley Dean) is a writer and motivational speaker and is often not around for special events like birthday’s and such. 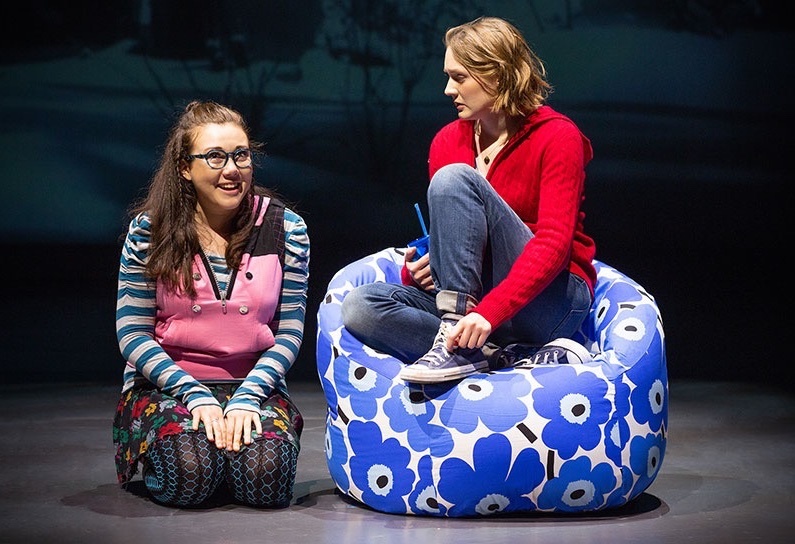 Between her mother Beth (Mamie Parris) and her twenty -year old sister Kate (Charlotte Maltby) who is away at college…and a vegan, Frank worries about Alice more than is necessary, according to him. On this day Frank and Alice argued in person when he burst on to the scene and later on in a phone conversation on how the two can hook up for her birthday. He will be home for only a short time before he’s off to his next gig. His plane was leaving, so he said, in a few hours so there is not much time. On her side: she’s busy, has plans and it’s too late to change anything. Sound familiar? The news that Frank died in an auto crash on his way back from the airport, and on a road not that close to their home (“Route 33”) set a whole new way of thinking for Alice, her world chorus, or ‘shape -shifters’ or ‘Furies’ (XimoneRose, Mackenzie Warren and Charlotte Mary Wen) as each contemplate how to move forward. Somewhere between Alice’s grieving and healing, the audience is pulled into a quasi-mystery looking for a solution. Where was her father going and why did he not board the plane to his next gig? Why was he in close proximity to where she was partying? Why can’t she remember the argument they had, and about what? Endless questions abide, but important ones that will keep nagging in her head if she doesn’t change the narrative. Leaving it to the Furies is a good choice as they have no skin in the game except to clear Alice's mind. The questions asked are as complex as are the answers she seeks. They ask about Frank’s death, what he said to her what she said to him (“Did you call him back?”) and finally raising questions as to why he was driving on that particular road after his plane took off? They also expand the story by showing up at the funeral and help her move through her guilt and grief with added light-heartedness to an already heavily themed topic. It starts at he funeral reception that turns into somewhat of a circus like atmosphere as the choices of food brought in by neighbors doesn’t suit Kate’s vegan diet. Not including her mother, sister, best friend Hannah (Livvy Marcus) and favorite teacher, Ms. Hopkins (Dan’Yelle Williamson) The Furies, as those paying their respects, quote from Frank’s self help book (“TransforMotion”), that Alice had yet to read, and meandering about, sort of disturbing the peace. “The music is the language of Alice’s grief” according to Johnson. She allows that listening to Sondheim, Ravel and Debussy had a specific influence on her music and the fact that she stole some chord progressions from Radiohead, Joni Mitchell also “helped me build Alice’s world” that also gave voice to her world while grieving. Putting it all into perspective, Hearn walks into the part of Alice first questioning and then showing us her vulnerability and confusion (“Control What You Can”) as she moves through her grief stricken world almost dreamlike with stories in her head that need to be resolved. Under Edelstein’s deft direction this new piece comes off as polished, convincing and a delicate essay on 'life after' in an unapologetic way. 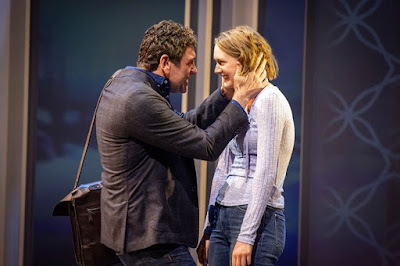 Bradley Dean’s Frank is as realistic a father’s role as I can fathom; pushy, loving and concerned by lending his voice and becoming a part of her healing: “Stop looking for the story; look only look for me.” Not bad advice when he sees his daughter looking for clues in all the wrong places. Charlotte Maltby’s Kate and Mamie Peters play well off of one another as older sister and mother especially when the both decide it’s time to paint over the rose wallpaper in Frank’s office. It’s a great scene using Sven Ortel’s projections, with particular focus on watching the roses disappear in a number called “Wallpaper”. Dan’yelle Williamson and Livvy Marcus are Alice’s favorite teacher Ms. Hopkins and BFF Hannah with Hannah downright intruding and funny but uncomfortable not knowing whatt to say to her friend. On balance her teacher adds another dimension to the mystery of some of the whys. 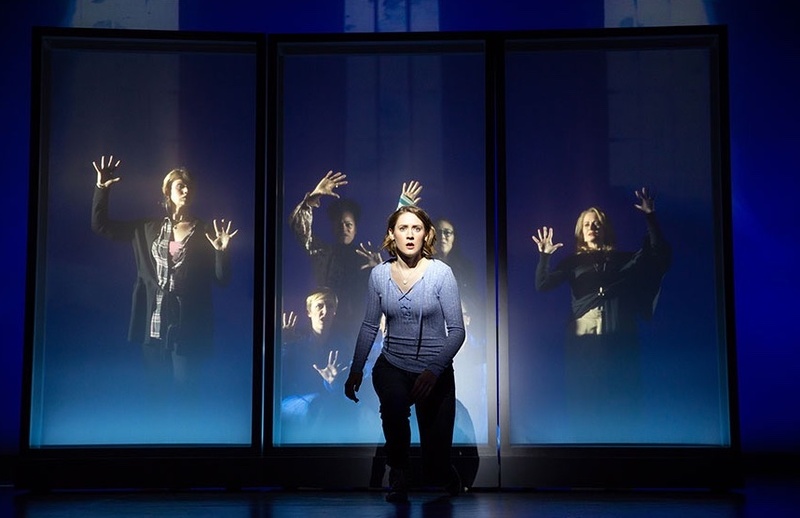 Neil Patel’s scenic design is airy and light -weight with moveable screen like modules or scrims positioned in a variety of forms pushed about by cast and crew dressed by Linda Cho, and creating locations apropos to the story. This is all set against Ortel’s Canadian neighborhood background projections and Japhy Weideman’s effective lighting design and a final scene that will drop your jaw. 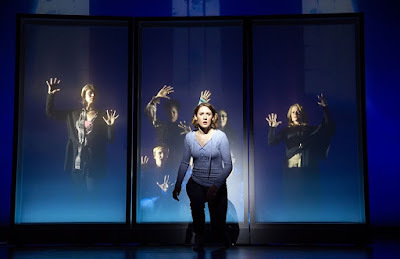 Moving the story along the playwright, author/ composer’s more than twenty or so musical numbers, sung through as dialogue, similar to “Next To Normal” is beautiful but not memorable, lush but not anything you will be caught humming on the way out but more than perfect for what it represents. Musical supervision, arrangements and orchestrations by Lynn Shankel, Chris Kong’s musical direction with a six piece ensemble, and subtle choreography by Ann Lee puts this young play and playwright in the spotlight where it belongs thanks to the Old Globe’s stunning, new and not to be missed production.